For Scottish artist Christine Borland, the role of the artist is to ask questions or intervene in spaces where there are no answers. Often working with objects housed in institutional collections and collaborating with specialists in the fields of forensics, science and medicine, her works reveal very personal narratives as well as wider questions surrounding the ethics and care of the human body. 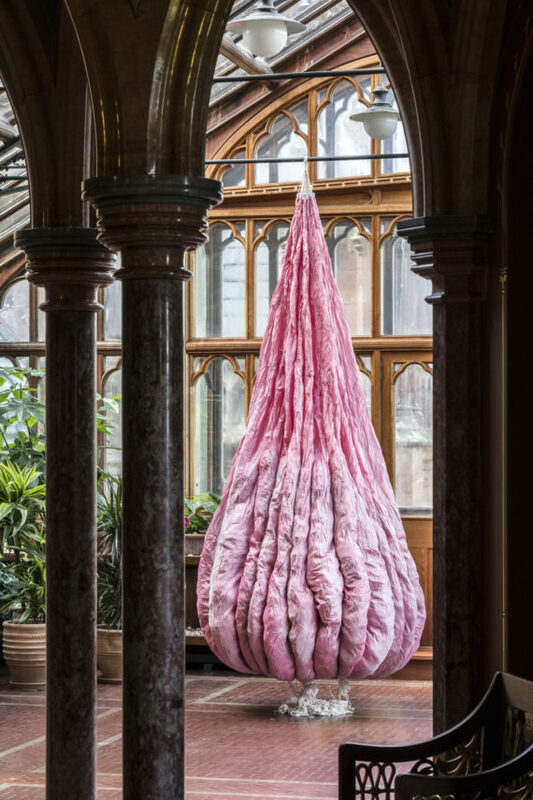 Borland’s current show ‘to The Power of Twelve’ sees her return to the Grade A listed Mount Stuart, a neo-gothic country mansion on the island of Bute, 30 miles west from Glasgow. Her exhibition looks at Mount Stuart’s history as a first world war naval hospital to coincide with the centenary of the Armistice. 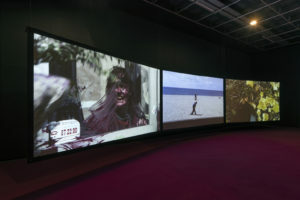 Borland graduated from Glasgow School of Art Environmental Art course in 1987 and from the University of Ulster in 1988. She is associated with the Young British Artists movement of the 1990s and was nominated for the Turner Prize in 1997 for which she exhibited The Dead Teach the Living, a series of reconstructed human heads copied from specimens held in a German anatomy collection. Recent projects have included solo exhibitions at Glasgow Sculpture Studios (2010), Camden Arts Centre, London (2011) CCA, Glasgow (2015) and Stroom Den Haag (2016). Since 2017 Borland has been working on a co-commission for 14-18 NOW and Glasgow Museums to research the museums World War One Collection. The resulting exhibition will open at Kelvingrove Art Gallery and Museum in October 2018. This is the second time you’ve worked at Mount Stuart? Yes it is. 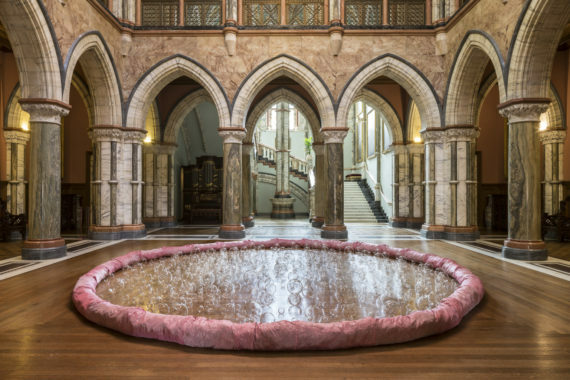 I focused then on the time of world war one, but I really did feel that I could just think about Mount Stuart for decades, so it was incredible to be asked 15 years later. I think there’s something a little bit different about it compared to the other works I do, maybe because of the percolation time. Your new work for Mount Stuart is quite experimental? There’s a series of black and white photographs that depicted all the rooms that were turned into wards, a dispensary or an x-ray room, so last time I focused quite tightly on that. This time it’s almost as if I’ve done the most obvious work that came to me in the relation to the hospital time, and so now the works are tapping into something a little bit different. I think they’re a wee bit atypical. I’ve really allowed myself to indulge in materials. It takes a lot to do something that might disrupt the scale of the house – which none of the works do – but I think they have a presence. You wouldn’t want to compete, it’s pointless: the scale, the opulence, the grandeur, the lavishness of the materials, the amount of materials, the amount of room, craftsmanship, layer upon layer, it never ends… Yes, sometimes you can do something quite simple and against all of that backdrop it sings somehow. Aside from the photographs of Mount Stuart as a hospital, was there anything else in the building that caught your eye? I took a closer look at the archive again when I began working for this project and there were one or two materials and objects that caught my eye because they bridged Mount Stuart’s collection and Glasgow Museum’s WWI collection. 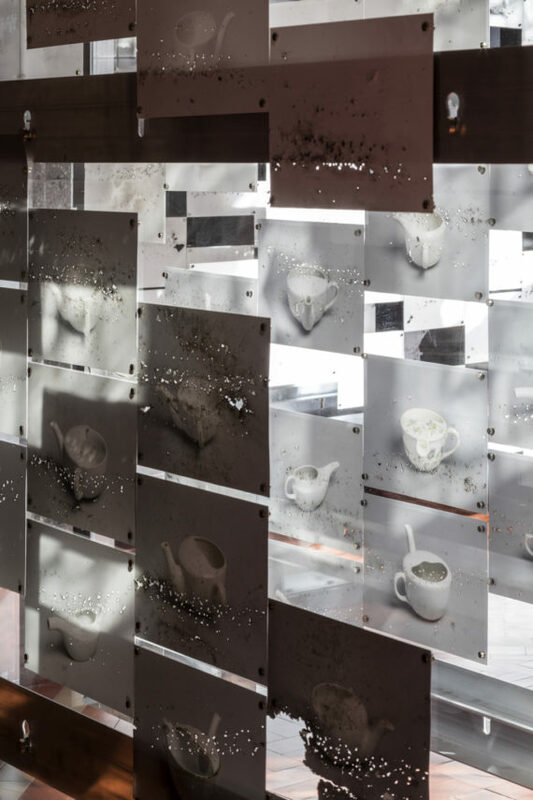 One of the things there that resonated was a white ceramic series of objects called invalid feeder cups; quirky strange little objects that are like a cross between a teapot and a cup, like teacups with spouts almost. They were used in nursing for feeding people liquid food. Each of these little objects creates a lot of aura around it because its function follows its form so clearly: that need for two people to be engaged in an intimate relationship, one picking up and holding the head of the patient and administering the liquid. 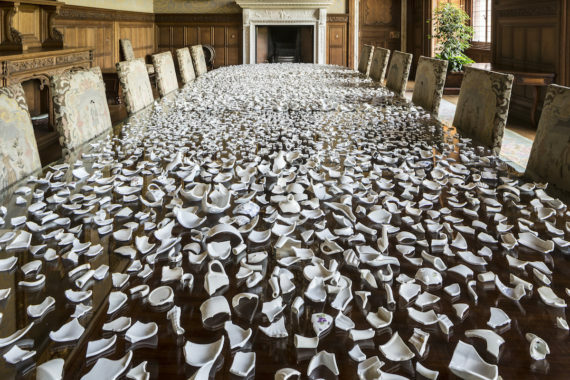 The piece of work that’s in the dining room is a whole table of fragments of porcelain; a collection of these feeder cups that have been exploded. Through researching them I found out that they were very popular in Victorian times. They’re like parlour objects, and certainly in the Victorian period if you were nursing an invalid at home you’d be likely to be wealthy, so even the nursing equipment reflected that. Families would nurse people or you’d have a nurse in residence, if you had a residence like this. The ones here are in relation to the hospital time: millions and millions of them were produced and they were used on the home front and in field hospitals for nursing wounded soldiers. I see how the social relationships connect in. That’s right. 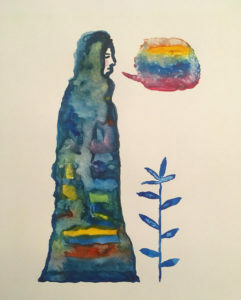 To take that a step further, through the research, and a bit of serendipity – that’s another thing, these chance meetings of research, materials, narratives, threads weaving themselves between works, that’s something I’ve allowed to come through in a more lyrical way than I would normally. But as I was going to say, I discovered in Glasgow Museums archive some suffragettes’ letters: two sisters from Glasgow who were imprisoned in Holloway for breaking windows. I’ve already described the performativity of the object in the space it occupies, but in their letters one of them described being force fed in prison using the feeder cup. She described this same object, and so that was something that really informed the kind of duality and the power embodied by this simple object. Just that switch between the patient and the person administering: it would always be the doctor in prison who was administering, so it would be the male doctor and the female prisoner. Whereas with the war it was the other way round, it was the female nurse and the male prisoner. So there is one major work using these feeder cups here, but I’ve very much taken that as a main motif for my Glasgow museums project that’s opening in October. There’s something in this work about technology and obsolescence as well? Absolutely, and I suppose that led me to the decision to take them to Flanders and to controlled explode them. The name ‘invalid feeding cup’ very much describes the period where it was in use; the term invalid was really not so relevant by the 1950s. It’s a kind of bracketed historical time frame that’s inherent in the name and the function. Especially when it’s something that’s so low key when you look at it, but actually it’s just telling this incredible story. Could you talk about the period of history where the house was used as a hospital? I think a lot of historic homes were requisitioned by the army and navy and forced to turn themselves over, but this one was very much a voluntary gift by the then Marquis and Lady Bute. Lady Bute got herself medically trained and she was the matron, so the vast proportion of the rooms and certainly the marble hall had 50 beds in it. That was a general ward and other big rooms like the drawing room and the dining room were medical wards relating to specific injuries. The conservatory was used as an operating theatre by some of the best-known surgeons in the UK. It was the first war of technology. Of course during wartime medical advances just leap, especially in relation to prosthetics, reconstructive surgery and wound care; all of these advanced enormously after WWI. You really enjoy working with collections and archives. What excites you? That potential to unravel and destruct a little bit among collections is something that really excites me. I like working within institutional boundaries and I like pushing those boundaries a bit, but I wouldn’t be going in and saying this is what I’m here to do. Part of that is seeing the personal in the general, the hidden narratives? Being drawn to early medical collections and while at art school going to draw in the anatomy museum, just early on asking questions of myself or somebody there like: “This is an incredible preserved artery injected with mercury,” for example. And: “Oh, whose is it?”; “Hmm, oh well nobody usually asks that.” Aside from being drawn to the aesthetic nature of the object, it was a no brainer to ask those kind of questions. Although collections seem to be quite fixed, actually there’s a lot of room for the role of the artists to ask questions or intervene in spaces where there are no answers, where there’s only suggestions. That ties in with a wider question about materials. You’re quite sensitive about your choice of materials? I’m especially interested in the more sculptural works that are using more traditional materials that can’t help but carry their own story and their own history in relation to their use. I’m always really struck by that Ian Hamilton Finlay work attached to the wall in Kelvingrove that’s a huge chunk of Carrera marble; the same as in the house here. It says ‘Clay the Life, Plaster the death, Marble the revolution.’ It’s just an incredible shorthand of materials and their associations. I have a shorthand like that, and I think it works with many kinds of materials. You have such close connections to Glasgow, what are your feelings about the Glasgow School of Art fire? I’ve gone through a gamut of emotions since it happened. They won’t be surprising. Shock, disbelief, horror, anger but ultimately we’re ending up with hope. Actually on the day, on the Friday I was at the graduation because Sam Ainsley and David Harding, who were my tutors, were getting honorary doctorates, so just the messages of hope at the graduation around the reopening of the Mack, to then be hearing about it burning down again that very evening; it was just a horrible juxtaposition. Actually I did go to Glasgow just for the evening – to do something that had been programmed in – and I walked as near as I could down the bottom of the hill and just looking at the bones and my goodness what elegant bones they are. It’s just a shell, but wow! Coming back to this space again you must be thinking about your younger self. 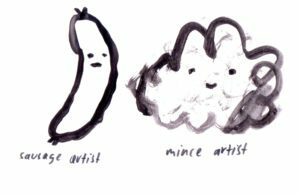 Can you say anything that would be helpful to the next generation of artists? It just feels like it’s the right time to do as much as you can and the best you can. Whenever these moments arise, whether you’re 50 or not – just seizing the moment. I can’t help but quote David Harding; he, Sam and Sandy [Moffat] all gave really inspiring speeches in the graduation ceremony but David ended by saying it’s trying to find the right balance of taking your time, listening, and trying to seize the moment, so he said: “Take it easy, but take it.” That sums up what I’m trying to say. There’s no pretension there. It’s very simple. That struck an absolute chord.